The 20 things you may or may not know about champion mare Winx! 1. Saturday’s George Main Stakes win was Winx’s 20th Group One victory – a world record under the Pattern system. She went past the previous world record of 16 wins set by American legend John Henry when she won the George Ryder Stakes at Rosehill last season. Her latest win was her 30th in a black type race, surpassing Sunline's Australasian record of 29 stakes wins. 2. Winx has amassed $19,547.420 prizemoney, making her the greatest earner in Australian racing history and placing her sixth on the list of all-time prize winners worldwide behind Arrogate (US); Gentildonna (Japan); Orfevre (Japan); Gun Runner (US); and Kitasan Black (Japan). 3. Winx – stable name ‘Winxy’ - won her only two starts as a 2YO and her first as a 3YO. She won only once in her next seven starts before her 27-race winning streak began on May 16 in 2015 in the Sunshine Coast Guineas in Queensland. 4. Winx’s winning run since the Sunshine Coast Guineas covers 1219 days to September Black Caviar’s unbeaten streak of 25 wins from 25 career starts was spread over 1456 days. 5. 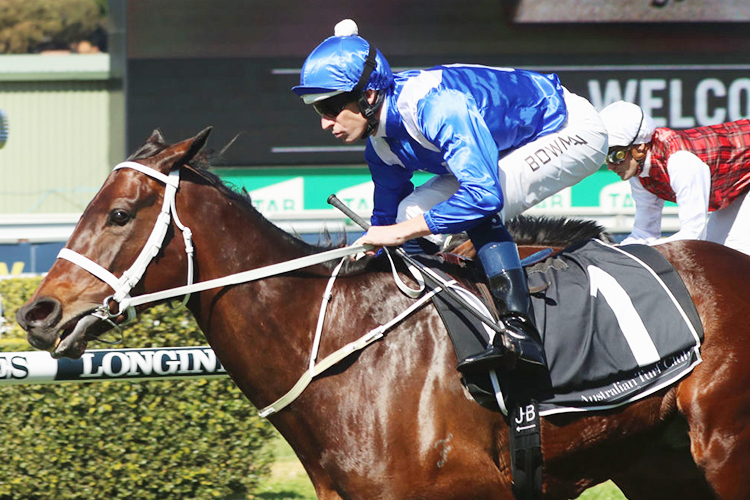 In April of 2016, when nine wins into her winning streak after her victory in the Doncaster Mile, Winx underwent an arthroscopic procedure to remove a bone chip in her near fore fetlock. She resumed racing and winning four months later. 6. Winx’s 27 straight wins have been achieved on seven different tracks - 16 at Randwick, three at Moonee Valley, four at Rosehill and one each at Flemington, Caulfield, Doomben and the Sunshine Coast. 7. Winx has been ridden to victory in her 31 wins by five different jockeys - Jason Collett, Tommy Berry, Hugh Bowman, James McDonald and Larry Cassidy. Only Bowman (25 wins), McDonald and Cassidy have ridden her during her 27-win streak. 8. The mighty mare won her first four races over distances of 5 1⁄2 f, 6 f, 7 f and 7 1⁄2 f. Since her winning streak started she has won over 6 1⁄2 f, 7 f, 7 1⁄2 f, 1 m, 1 1⁄4 m, 1 1⁄4 m and 1 3⁄8 m.
9. Her winning streak includes five trebles in the WS Cox Plates, Chipping Norton Stakes, George Ryder Stakes, George Main Stakes and Warwick Stakes (renamed this year the Winx Stakes in her honour). She also has notched doubles in the Apollo Stakes and Queen Elizabeth Stakes. 11. Only three of her 27 successive wins have been under handicap conditions in the 2015 Theo Marks Stakes, 2015 Epsom Handicap and 2016 Doncaster Mile. Her other 24 wins have been under wfa or set weight conditions. The combined winning margins through Winx’s winning streak amount to more than 80 lengths. 13. Winx’s greatest winning margin is eight lengths in the 2016 WS Cox Plate. Her shortest margin has been 0.2 lengths in the 2015 Theo Marks Stakes and 2017 Warwick Stakes. Since her winning streak started the total racing time spent by Winx in her 27 starts has amounted to 45 minutes 18.2 seconds. 15. During her winning streak she has contested 16 barrier trials between race starts but has won only three of those trials. Her breeder John Camilleri (Fairway Thoroughbreds) sold Winx for $230,000 at the 2013 Gold Coast Magic Millions Yearling Sale to Peter Tighe’s Magic Thoroughbreds. She attracted 19 bids after an opening offer of $40,000. 17. WInx’s dam Vegas Showgirl, by Al Akbar, won seven races in NZ and was a stakes winning 2YO. She was sold as a breeding prospect by Dormello Stud at the 2008 Magic Millions National Broodmare Sale where she was purchased for John Camilleri by agent Colm Santry for $455,000. Vegas Showgirl’s only other runner from seven foals to date is El Divino (2013 Snitzel), a Group winning 2YO who died last year after a trackwork accident. Her earlier named foals Win Win Leader (2012 Fastnet Rock) and Miss Atom Bomb (2010 Encosta De Lago) trialled but never raced. 19. Vegas Showgirl, who was crowned Australian Broodmare of the Year for the second time last year, is also the dam of the Snitzel colt named Boulder City who topped the 2016 Australian Easter Yearling Sale at $2.3 million when purchased by Gai Waterhouse and Blue Sky Bloodstock. He was retired to stud this year without a race or trial. Vegas Showgirl produced a filly by Snitzel in 2016 named Courcheval that has been retained by her breeder John Camilleri. She produced another filly by Exceed And Excel last spring and is now in Japan where she is to be served to southern hemisphere time by Deep Impact before returning to Australia.